People are exploring the use of 3-D printing for wide-ranging applications, including manufacturing, medical devices, fashion and even food. But one of the most efficient forms of 3-D printing suffers from a major drawback: It can only print objects that are gray or black in color. Now, researchers have tweaked the method so it can print in all of the colors of the rainbow. They report their results in the ACS journal Nano Letters. Selective laser sintering (SLS) printers use a laser to heat specific regions of a powdered material, typically nylon or polyamide, so that the powder melts or sinters to form a solid mass. The printer adds then selectively sinters new powdered material layer by layer until the desired 3-D structure is obtained. To reduce the energy requirements of the process, researchers have added compounds called photosensitizers to the polymer powders. These materials, such as carbon nanotubes, carbon black and graphene, absorb light much more strongly than the polymers and transfer heat to them, enabling the use of cheaper, lower-power lasers. However, the carbon-based photosensitizers can only produce printed objects that are gray or black. Gerasimos Konstantatos, Romain Quidant and their coworkers at The Institute of Photonic Sciences (IFCO) wanted to find a photosensitizer that would enable color printing by the SLS method. The researchers designed gold nanorods to strongly absorb in the near-infrared region of the spectrum while being almost transparent to visible light. They coated them with silica and then mixed them with polyamide powders to print 3-D objects. They found that the gold nanorods were much better at converting light from the laser to heat than carbon black, the industry standard. 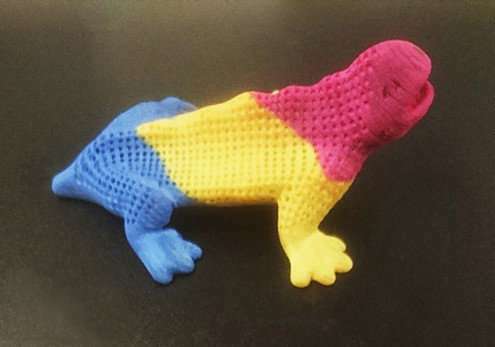 Also, the new photosensitizers could produce much whiter and —- when mixed with dyes —- brightly colored 3-D objects. Importantly, the materials are cost-effective for large-scale production. The researchers have filed several patent applications related to the new technology. Weeeerl...fast and colorful? Sure. But Laser sintering machines (and materials based on gold nanorods) ain't exactly what I'd call 'cheap'.